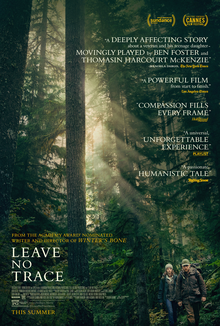 Leave No Trace is an excellent movie directed and written (with Anne Rosellini) by Debra Granik. Granik’s last film was the equally impressive Winter’s Bone from 2010. Even though Leave No Trace takes place in Oregon and Washington and Winter’s Bone in the Missouri Ozarks, both demonstrate Granik’s fondness for rural, wooded places and the people who inhabit them. It’s not often movies feature rural settings and their inhabitants with dignity and respect. Another similarity between the two movies is the presence of strong young actresses. Winter’s Bone featured an Oscar nominated performance by young newcomer Jennifer Lawrence. Leave No Trace features an amazing performance by a young New Zealand actress named Thomasin McKenzie. Like Jennifer Lawrence, it would be great to see Tomasin McKenzie receive an Oscar nomination next year for her first performance. Leave No Trace tells the story of Will (Ben Foster, also excellent), a veteran suffering from PTSD. As the movie opens, Will and his teenage daughter Tom (McKenzie), are living in a large, urban park in Portland, Oregon. As a result of his PTSD, Will needs to be in the open, unable to live in a conventional house around other people. Will is distrustful of everyone but Tom. Will and Tom speak of Tom’s mother in a way that makes it sound like she is dead. Father and daughter have a very close relationship, and they rely totally on each other. Will and Tom are spotted in the park and brought into Portland by authorities who tell them that they cannot live on public land. They are questioned and receive psychological testing. Afterward, they are released to live on their own in a house on a pine tree farm. Will works on the farm while Tom befriends some of the neighboring kids and attends meetings of Future Farmers of America. Even though they are well treated, the situation is uncomfortable for Will. He soon packs his backpack and heads back into the woods, taking Tom with him. Leave No Trace is a quiet, intense film. There’s not a lot of action or dialogue as it follows Will and Tom back into the woods again. Even though they love and rely on each other very much, tension inevitably arises. Tom longs for stability and community, whereas Will must keep moving. There’s a gentleness and kindness to Leave No Trace that is remarkable in movies today. People treat each other with respect and kindness, whether they’re park rangers, social workers, homeless people, truckers, or folks living in the woods. The people who live in the woods understand each other and seem to intuit that some people come into the backwoods because they can’t live with others in a conventional way. When Will and Tom find themselves in a small community deep in the woods, Tom tells Will, “Those people aren’t that different from us.” People watch out for each other, while still respecting privacy, in a way that seems to have all but vanished in our contemporary society. Will doesn’t talk about his war experience, but you can see the pain in his very expressive eyes. The way Will wakes from a dream and a glimpse of a newspaper headline found by Tom are enough to let the viewer know that he is haunted by painful memories that he’s unable to share. Tom moves with her father, the only family she knows. However, she eventually begins to question his need to keep moving, and not let her settle down. “What’s wrong with you isn’t what’s wrong with me,” Tom tells Will, in a touching, beautifully written and acted scene. Leave No Trace is a unique, thoughtful, and emotional movie. It has an authenticity about it. It’s gentle, without being sentimental, and never condescending to Will, Tom, and the people they encounter along their journeys. I liked this movie a lot, and feel certain I’ll want to see it again. I’m glad Debra Granik brought this story to the screen. I hope I don’t have to wait 8 years for her next movie.